When my brother was a little boy, he got to go on a combine with one of the farmers from our church. I was always secretly jealous of him…until now! As part of the Field Mom program through Illinois Farm Families, I was able to go on a field trip (literally)! Last Saturday, it was my turn to climb up the ladder and get in the cab. The corn was a little greener than it should have been. 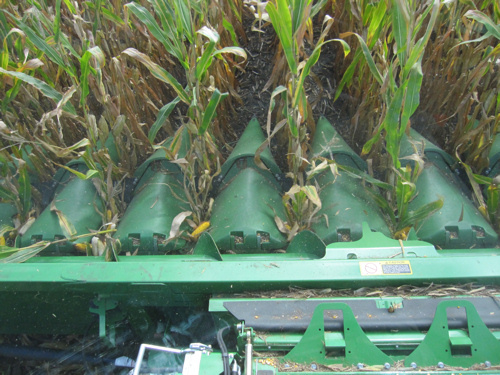 The wet spring we had in Illinois delayed planting, and as a result the corn isn’t quite ready to be harvested yet. 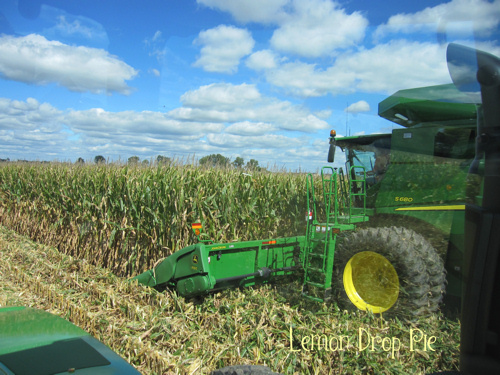 As part of our experience, the farm family we visited wanted to show us how a combine harvests corn. Even though the corn is a little green, they will be able to feed it to their livestock. When the rest of the corn is ready, they will harvest it and put it in a dryer to prepare the corn for storage. Did you know that most of the corn you see growing in fields is not sweet corn? It’s feed corn for livestock such as cattle and hogs. Corn is a type of grass, but unlike your lawn, farmers need to plant corn every spring. As I was up in the cab, I watched the driver aim the large cone-shaped thing-a-ma-jigs (I don’t want to get too technical on you) at the corn rows. 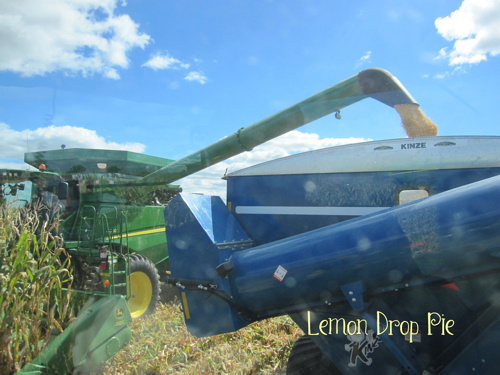 Once he had the combine in the right position, the guidance system took over and we could enjoy the ride. The monitor up front showed us how many bushels of corn each acre was yielding. The screen is color coded; dark green is the best yield an acre can have, and red meant that acre was low yielding. Farmers use this information to help them prepare the fields for the next growing season; while we were harvesting this year’s crop, the information we were gathering was already being used to plan next spring’s planting. I was also able to ride in the tractor pulling a corn cart. We followed a combine, which dumped corn into the cart as we slowly drove beside it. I’ve often seen combines and tractors in the fields as I drive on I88 across Northern Illinois. This time, I was the one in the tractor! The small field we were in was right next to I88, so from my seat, I could see the cars racing by. Soon there will be a lot more combines out in the fields, harvesting corn and soybeans before winter sets in. I love being a Field Mom and learning so much about life on the farm! Watch for my article about cattle and more, coming soon! If you are interested about reading more about farm life and what it takes to get ready for harvest, read this article on the Watch Us Grow website by Roganne Murray. As a farmer’s daughter and a farmer’s wife, she knows a little something about combines! Is there something you’ve always wanted to know about farming? Let me know in the comments, and I’ll try to find an answer to your question! ← My First Topic for Spin Cycle! I actually did know that about the sweet corn – learned it on a school field trip to a corn maze with one of my kids. I have never been up in a combine before, though! How cool! I didn’t know that about the sweet corn? So where is the sweet corn growing that we eat? In the same fields, but smaller sections? That’s a great question! I had to get out my corn fact page for an answer. Most farmers only grow field corn, not sweet corn. Only 1 percent of the corn grown in Illinois is sweet corn. We simply don’t need that much! Field corn is used to feed livestock, to make corn products such as corn syrup and ethanol, and farmers export some of the corn they grow overseas. I’m going to try to get a picture I saw this weekend that shows the difference between sweet corn and field corn to post on my blog later.